The Wilkes family owned several properties in central Thornbury in the early 1800s. 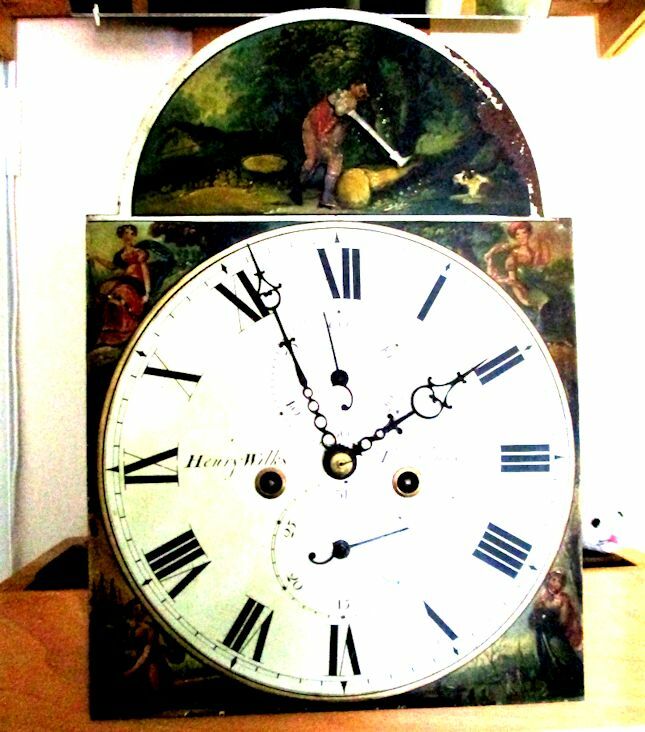 Henry Wilkes was a watch and clock maker. “Gloucestershire Clock and Watchmakers” by Graham Dowler says that Henry Wilkes was apprenticed in 1793 in Bristol. Henry married Mary Williams at the church of St Phillip and St Jacob in Bristol on 23rd September 1811. They had three children: Ann baptised on 14th July 1813, Jane baptised on 12th July 1815 and buried on 17th December 1815 and Emma baptised on 18th June 1817. The records show that from about 1826 Henry owned several plots of land and houses around the centre of Thornbury. It appears that he obtained the properties from Richard Williams, a tiler and plasterer. Henry’s wife, Mary, had been Richard William’s daughter in law (the wife of Richard’s son, John Williams). In his will Richard left his estate for the use of Mary, his wife, during her natural life, provided she did not re-marry. After Mary’s death, he left the Horseshoe and two other properties in St Mary Street (believed to be 53 and 55 St Mary Street) to his son, John Williams. Richard left other properties to his youngest son, Richard: a property in Castle Street, a newly erected house with a garden and orchard in the occupations of Robert Wiltshire and John Tilly (which later became known as 41 St Mary Street) and a new house built adjoining the Horseshoe (which might either refer to the house which became 25A or 27 St Mary Street). Richard’s son, John Williams, married Mary Bedggood on 3rd May 1801. John died aged only 26 and was buried on 9th June 1803. In his will he directed that the properties he expected to inherit on his mother’s death should be put in trust for the use of his wife during her lifetime and then given to his only son, James Williams. James died in 1817 aged 15. Thus the bequests made by Richard and John failed and John’s widow, Mary, inherited the property. By this time Mary had re-married and become Mary Wilkes. The clock shown here on the right was made by Henry Wilkes (or Wilks- the spelling seems to be variable) and is well known in Thornbury. It was in the Barrel Inn in Thornbury for about 150 years and apparently it kept good time there. Its case became very damaged and its movement was generously donated to the museum by George Ford, the son of a landlord of the pub. The movement has been restored and can be seen – still working – in Thornbury Museum. 1: The property in St Mary Street (previously known as The Horseshoe) where Mary Wilkes was living in 1840 which was to become 25 St Mary Street. 2: The 3 houses next to her house – which were to become 27, 29 and 31 St Mary Street. 3: Two other houses further up the same street which were to become 53 and 55 St Mary Street. 4: A group of 4 houses in Rock Street which were to become numbered 2 to 8 Rock Street. 5: Two attached houses on the junction of Rock Street and Horseshoe Lane which were to become 9 and 11 Horseshoe Lane. 6: A group of 4 other houses in Horseshoe Lane which were to become 13 to 19 Horseshoe Lane. 7: Two other houses in Tytherington occupied in 1845, when Mary wrote her Will, by Hannah Terrell and Sarah Winstone. In the 1841 census Mary was living with her daughter, Emma, at 25 St Mary Street. Mary was aged 60 (ages rounded down in this census) trading as a grocer. Mary died on 23rd March 1849 and was buried on 28th March 1849 aged 70 years. In her Will dated 17th January 1845 Mary left her daughter, Ann, the five houses in St Mary Street, except for the house where she was living (number 25). She specified that on Ann’s death these five houses should be passed to Ann’s children. She left number 25 St Mary Street and all the other houses in her estate to her other daughter, Emma. It is interesting to see that in her will Mary required that Emma “do permit and suffer her sister Sarah Winstone during her life to continue to live in her cottage situate at Titherington”. Ann Ann (nee Wilkes) – Ann was baptised on 14th July 1813. On 4th July 1838 Ann married Thomas Ann at St Andrews Church, Clifton. Their daughter, Mary Ann, was born in September quarter 1851. Thomas was born in Alveston about 1806. In the 1841 census he was a mason living at the house which later became number 31 St Mary Street, just a few doors away from where Ann’s family was living (although Ann was not at home at the time of the census). In 1851 census when Thomas and Ann were living in Chapel Street, Thomas was a builder employing three men. Ann died on 26th July 1856. On her death, the houses she owned in St Mary Street (numbers 27, 29, 31, 53 and 55) were passed to her daughter, Mary Ann Ann. The 1861 census shows Thomas living in another house in St Mary Street – we believe it to be the house which later became known as 53 St Mary Street, a house which had also been passed from Mary Wilkes to Ann Ann. Thomas was described as a master mason employing five men and two boys. He was living with his daughter, Mary Ann aged nine and a housekeeper, Sarah Winstone aged 34. Sarah was the daughter of Mary Wilkes’s sister, also called Sarah. The 1862 rate book shows Thomas had acquired six cottages in Gloucester Road (numbers 1 – 11). Thomas died on 1st July 1864. On Emma’s death, the houses inherited from her mother, were passed to her niece, Mary Ann whose married name was Mary Ann Wilmot. Thus Mary Ann Wilmot became the owner of all the properties listed above.